Note: Your specific Import Filter was selected when you created your data file - see step 1 of the Getting Started Guide. First select the Account Tab for the specific account. Click the drop down button to make your selection. Next select your Default Import Method. Click the drop down button and the available options for importing will be displayed. If BrokerConnect is available this is the preferred method of importing. The Import Button on the main toolbar should now show the name of your broker. 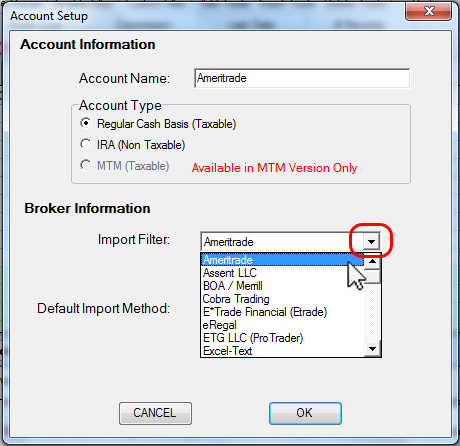 For example, after a user selects the Ameritrade import filter, the Import Button would read Ameritrade Imp. 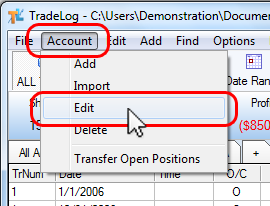 After updating the import filter of your data file, If you have selected to show import user guides in the Global Options dialog, a browser will open and take you to an instruction page that guides you step-by-step through the process of locating compatible trade history reports on your broker's web site. 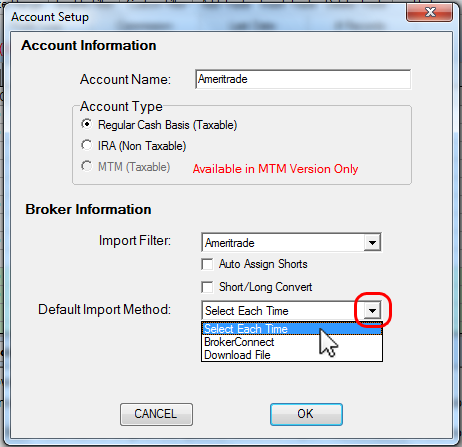 If this option is not selected, please see our Broker Import Filter Support page to identify the import method and obtain further instructions if this browser does not pop up. Occasionally, brokers will change the format of a trade history report. As each Import Filter is specific to a report format, when changes are made we must revise the appropriate import filter and issue a software update. If you notice that the format of your trade history reports has been changed by your online broker, please submit an Online Support Request. We will review the change(s) and release a software update, if necessary.